Half a million acre feet wasted to sea? That's what happened in 1995. But that was before we knew better, right? And restoration is on the way? The above bar chart shows annual discharge volumes out of the area formerly knows as the Southern Golden Gate Estates to tide. The historical percentiles are shown on the right. As you can see, over 300,000 acre feet still flowed over the weir in 2013. But those flows are numbered. Once the restoration project is complete, this wasted water will be used to rehydrate Picayune Strand instead, from where it will slow drip as sheetflow to the coastal estuaries below. 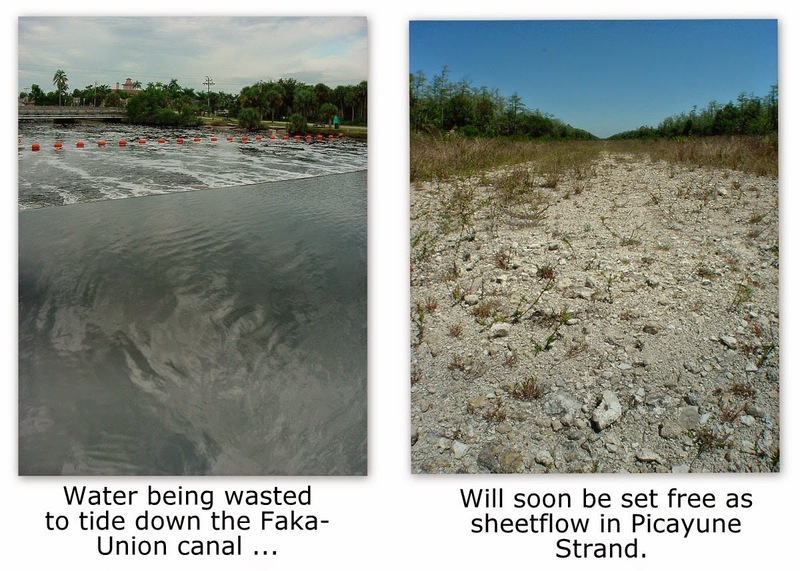 That wasted water will soon be used to rehydrate Picayune Strand instead.